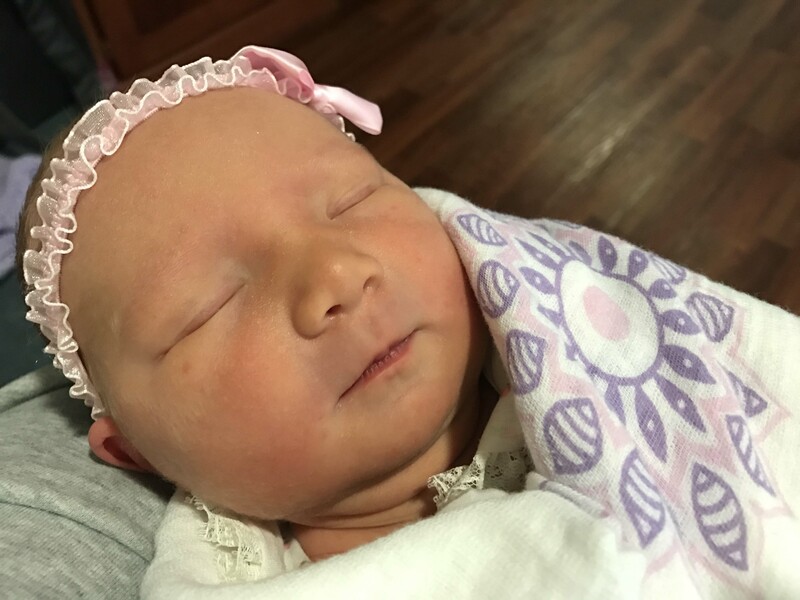 My first pregnancy with my daughter Charlotte was a walk in the park – no sickness, no pregnancy complications and nothing to complain about except for her being very overdue. 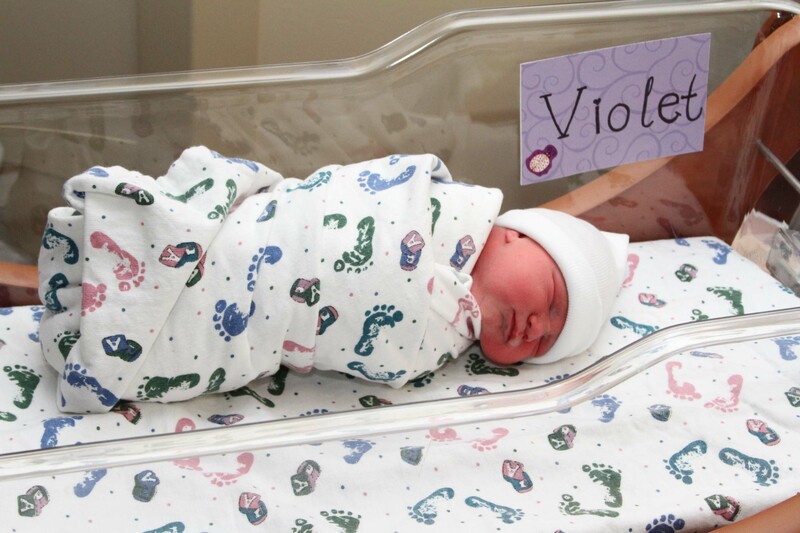 My pregnancy journey with our newest addition – Violet Belle – was a bit different. I was very sick the first semester, rendering me useless at home and missing a day here and there at work. I had lots of pelvic pain the final semester, was extremely exhausted, had lots of swelling and well I’ll spare you the details about bladder control and other fun things like that. Needless to say, I was ready to deliver my precious new bundle of joy! Fast forward to about week 34. At a routine doctor appointment following a severe 30-hour headache, my blood pressure was reading high. It hovered around 150/90, qualifying me for the ol’ pregnancy hypertension. Blood and urine tests pointed to mild preeclampsia. 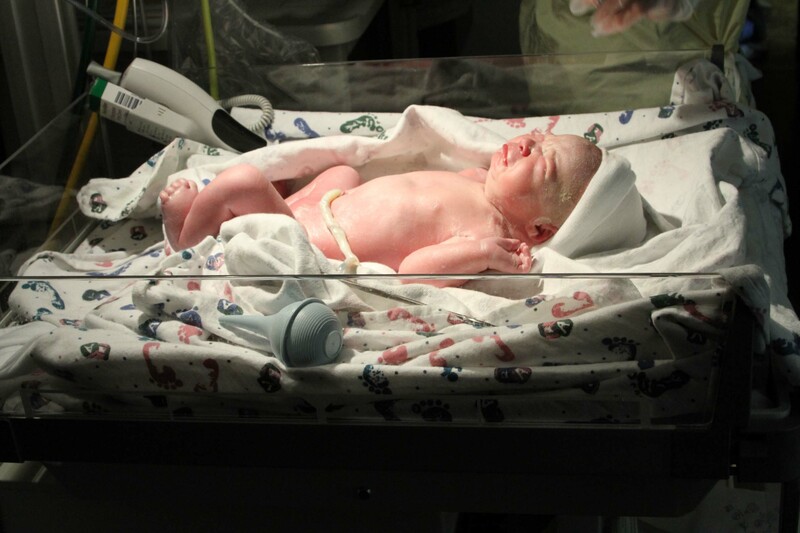 It wasn’t severe, so the plan was to do continued monitoring and try to keep the baby in until week 37. 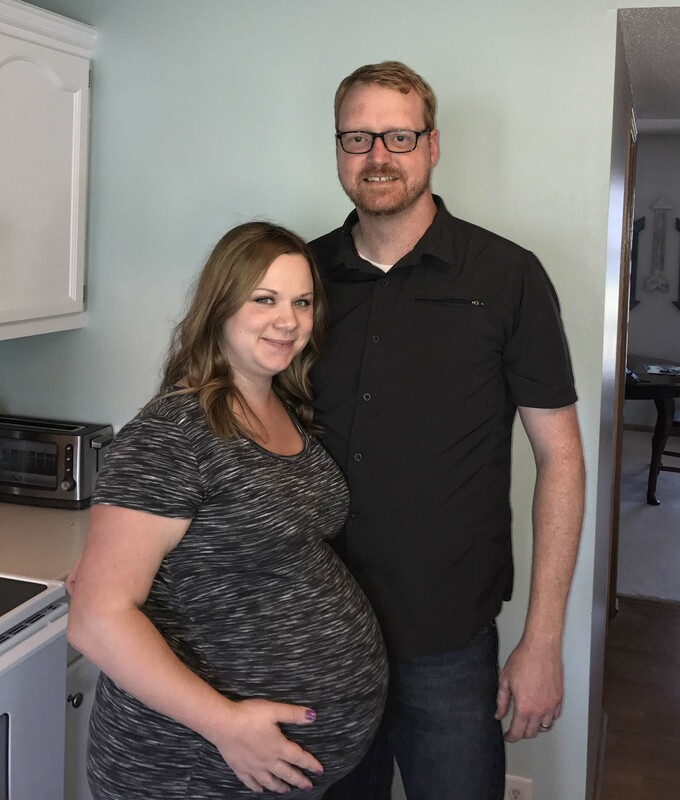 After biweekly non-stress tests and blood pressure monitoring, my induction was scheduled right on time at 37 weeks. We went into the hospital the evening of Sunday, July 2. We had a fantastic nurse Miranda who got me comfortable and administered Cervidil – a drug aimed to soften and hopefully open the cervix, at least somewhat. This did nothing for me during Charlotte’s induction four years prior, so Luke and I were prepared with movies and the hospital’s supply of popsicles. I was at 1 cm when we started the process, but we knew we were in for a long haul. We watched Mean Girls (my favorite) and Catch Me if You Can (Luke’s a big Leo fan). It was almost like a nice date night. And, delivering at UnityPoint’s Methodist West, it was like date night in a nice hotel! Toward the end of July 2nd, I took the Ambien the nurse offered and actually got some good rest. The next morning, not to our surprise, I was still at 1 cm, but “softer”, as they say in the biz. I got to shower and… eat toast! I didn’t get toast with my first baby. Score! I also got to have coffee, which if you know me – you know is a necessity for me to function. Our new nurse Tara got me hooked up to the Pitocin at 7 a.m. I started feeling contractions about 30 minutes later. By 8:45, my pain level was at a 10 (or what I thought at that point was a 10 – it would get worse). Dr. Polzin checked my progress and tried to get through to break my water. He said I was not progressed enough to get through, but holy hell did it hurt to have him try! About 20 minutes, my water broke when I got up to go to the restroom. Messy! Glad I wasn’t at Target or something. By 12:30 p.m., working with a new understanding of my pain scale, I was reporting pain levels of 7 and then 9. Things were moving along. 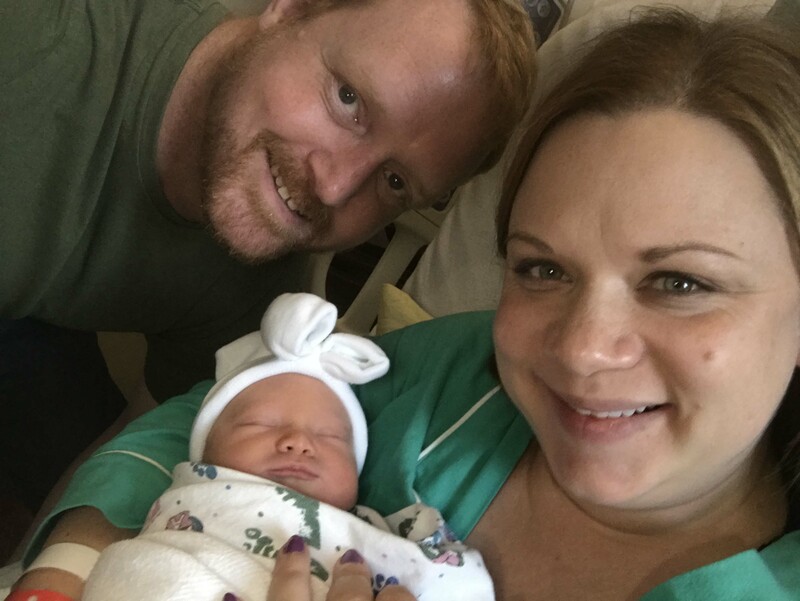 I was preferring not to get an epidural this time around, as I attributed weeks of lower back spasms after Charlotte was born to the epidural I had with her, although it certainly could have just been caused my labor. Anyway, at 1 p.m. 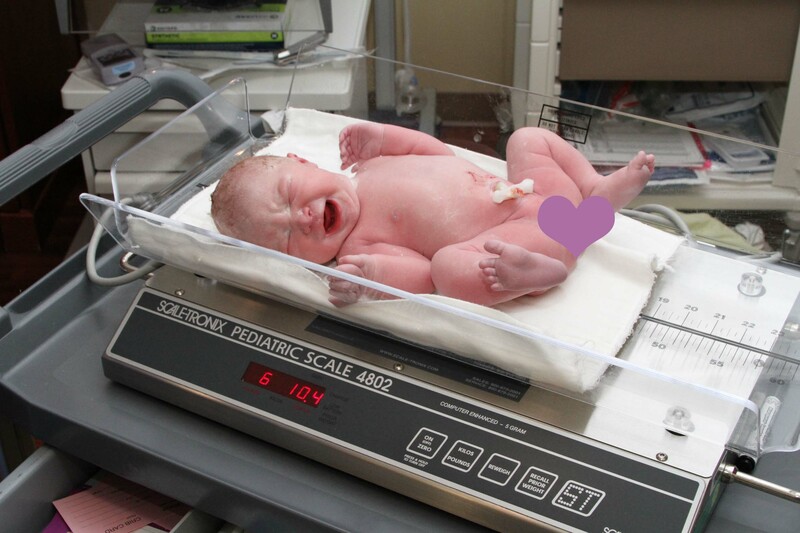 I opted to try fentanyl to hold off on the epidural. It immediately made me sleepy and warm and lowered my pain to a 6 – not perfect, but better. At my 1:30 check, I was at 3 cm, so they offered the epidural again. 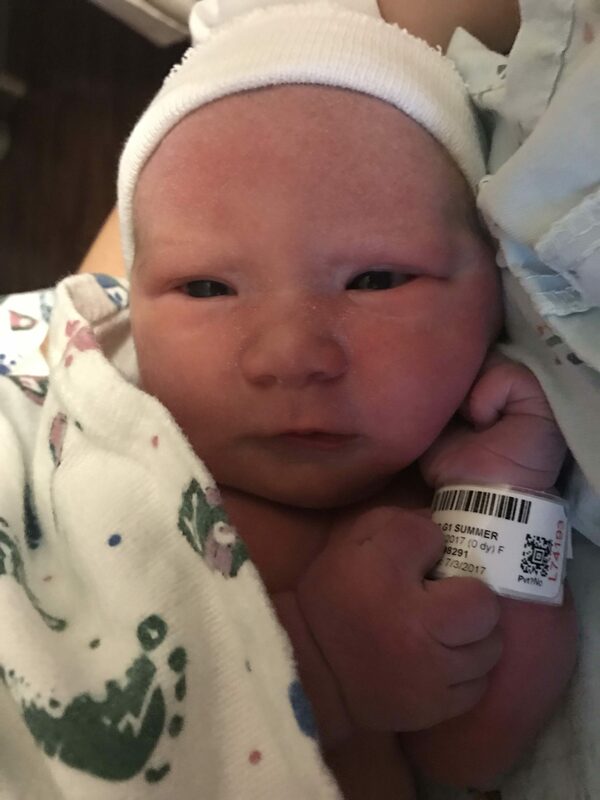 After much discussion with the nurse and anesthesiologist, I said “Let’s go for it.” There was no pain with the epidural placement, just some pinching. I was ready for some relief. Except… it never came. 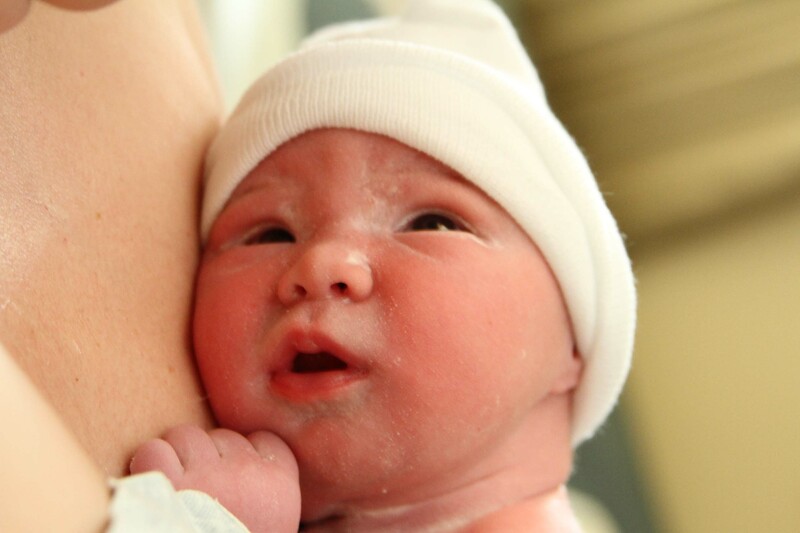 For some unexplained reason, the epidural did not work. I was struggling through the contractions. It was difficult for me to breathe. I really had no control over my body. After more than an hour of limping through the failed epidural, they shot a new cocktail of fentanyl and other things into my epidural. It immediately shot warmth through my body. I wasn’t pain free, by it took me from a 10 to maybe a 7 or 8. Hallelujah! I can deal with this. At 3:30 p.m., I was up to 6 cm and feeling a lot of pressure. The nurse left the room and told us to call when the pressure got worse. After all, I had four more centimeters to go, right? Just 20 minutes later, I could not hold Violet in any longer! I yelled for Luke to call the nurse and tell her that the baby was coming NOW! Tara came in and checked me. I was at a 9. It was just about time! She checked me again at 3:54 and I was at 10 – rejoice! She called Dr. Polzin and frantically told me not to push. He and a team of nurses came running. Equipment and rubber gloves went flying as they rushed. As soon as they were (sort of) settled, he said “This should only take one push”. So, I gave it my best. Then he said “Stop, the cord is around her neck”. As soon as he said it, he’d already cut the cord. 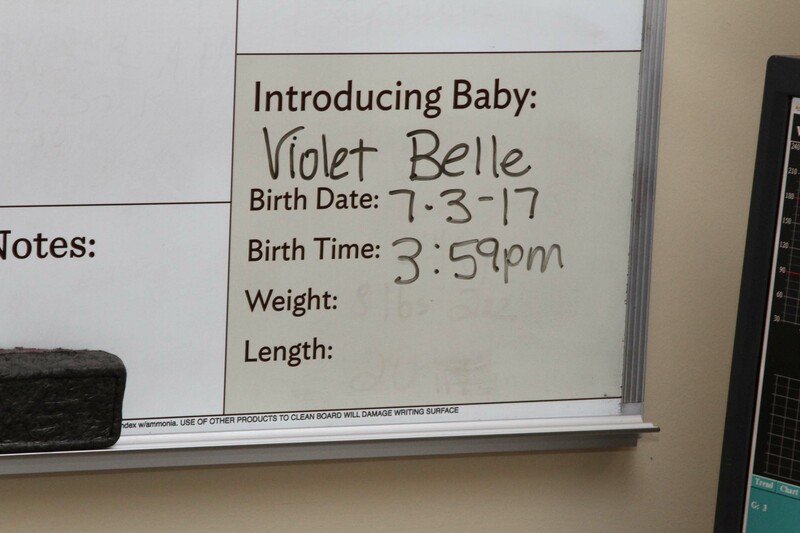 Then I got to finish my push, and out came Miss Violet Belle at 3:59 p.m.! She wasn’t crying and was a bit well, violet. They put her on my chest and the nurses were massaging her. She still wasn’t crying, so they took her to the little baby cart and suctioned her nose and mouth, and alas – she found her voice! 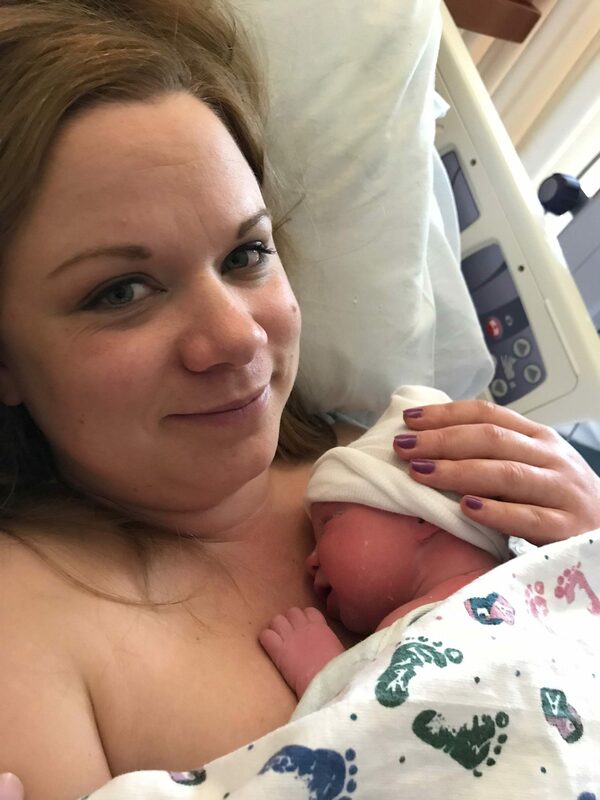 After they weighed her in at 6 lbs, 10 oz and measured her at 19.5 inches long, she got to come back to mama for some skin-to-skin time. I was, of course, immediately in love. I think she was too, as she was alert and staring into my eyes right away. 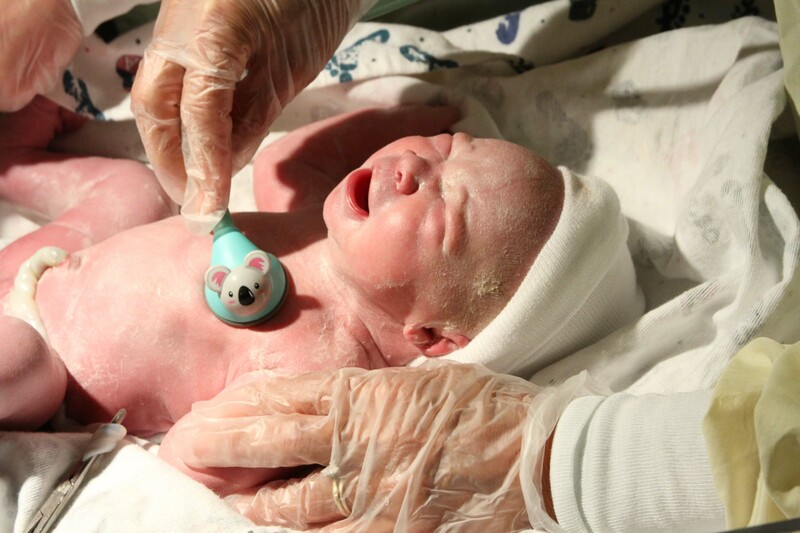 Just 30 minutes after she was born, she latched on to nurse right away and stayed there for a whole hour. Words cannot describe the relief which comes from getting that baby out and to have her be healthy! She had an APGAR score of 8/9, which the pediatrician said is pretty much they highest they give. Though she be little, she is fierce!